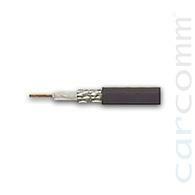 The RG-174 Coax cable is a thin and flexible cable suitable for various applications. The cables are availabe in different lenghts and with various connectors on request. - Insulation Resistance: AC100 Mega ohm/km min.